Amazon is to start trialing its drone delivery service in the UK, after being granted the approval of the government to carry out tests without some of the usual flying restrictions. The retailer giant was granted permission by a cross-government team, supported by the Civil Aviation Authority (CAA), to test drones without being shackled to existing rules that govern the use of remote-controlled aircraft. Amazon will be able to fly drones beyond the line of sight in both rural and suburban areas; test the drones' ability to avoid obstacles; and test-fly fleets of autonomous drones overseen by one person. 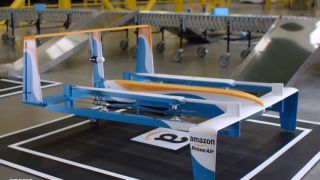 Not only will this give Amazon more leeway to test its miniature delivery aircraft, the findings will help inform future policy on the safe use of drones. Paul Misener, Amazon's Vice President of Global Innovation Policy and Communications, said: "This announcement strengthens our partnership with the UK and brings Amazon closer to our goal of using drones to safely deliver parcels in 30 minutes to customers in the UK and elsewhere around the world." Earlier this year Amazon said that there would be a time limit of 30 minutes put on all drone deliveries, which cannot exceed an upper weight of 55 pounds.